So the absorption rate tells us that if all conditions were to remain the same as the past 12 months, there are enough properties currently on the market to last 3.38 months. The absorption rates can be very useful information when selling and buying real estate. It is accepted that about a 6 month absorption rate is a balanced market. Lower rates became a sellers market and higher rates become a buyers market. The data and statistics we are presented though have to be looked at very carefully. 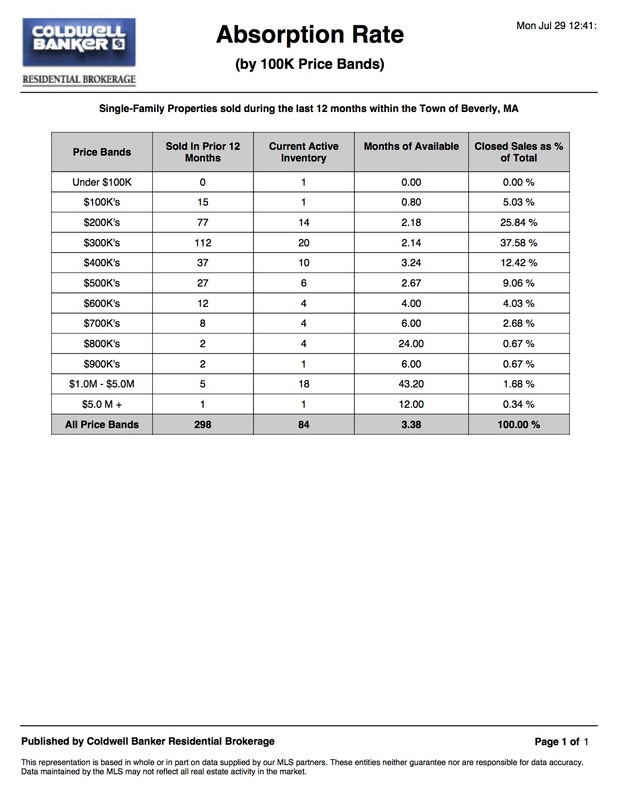 As you can see in the chart above homes in the $300’s have an absorption rate of 2.14 months and the ones in the $800’s have 24 month rate. There were 112 homes sold in the $300’s and only 2 in the $800’s which can also skew the data. The bottom line is that it’s not enough to just have data. to be useful we need the ability to interpret it and to see when the interpretation may be flawed. For market information that is relevant, and useful contact John & Cindy Farrell 978-468-9576.